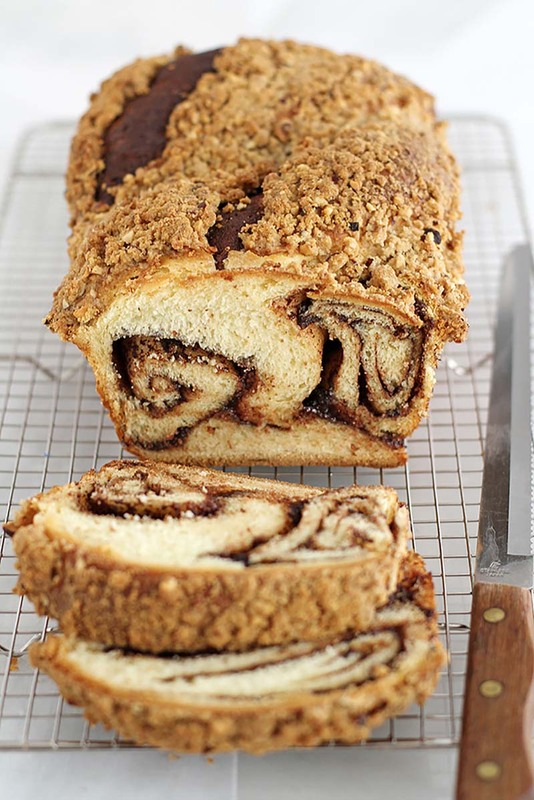 Swirl upon swirl of chocolate hazelnut spread and a buttery, nutty streusel topping make this babka one decadent and delicious bread. Shape dough into a ball and place in a large, lightly oiled bowl; turn to coat. Cover with plastic wrap and let rise in a warm place 1 hour to 1½ hours until doubled. Meanwhile, heat oven to 350°F. In a medium bowl, combine all ingredients for the streusel except the butter. Using a pastry cutter or your fingers, cut in the butter until mixture resembles coarse crumbs. Place bowl in refrigerator until loaf is ready to bake. Recipe created by Girl Versus Dough.